First of all, this was probably one of the most anticipated figure in 2017. I still like it and would never give it away, but there are certain flaws that don’t justify the price on this, compared to other MINT figures, considering in addition it doesn’t even include a body and headsculpt. Thanks to @AdamC who suplied me with this set and who probably had to endure my need for this limited suit most in the progress of me tracking it down. I apologize for that! The box art is simple and suits both versions. On the bottom the contact details. Don’t bother anyway, you won’t get any reply. This sculpt reminded me on Arnas Fedaravičius from the movie Siberian Education. Worth a watch. The standard Telnyashka. I tried to put it on a mannequin, however the shirt started making ripping noises, so I stopped. These are the most user friendly cloth gloves I ever had in hand. Took me only 2min to put them on one hand. However the material feels not so resistant, like felt and the fingers are too long. The boots slight on smoothly. Even with DAM feet that don’t bend on the toes. No need to work on the strings. This one actually has working zippers at the pant legs. Otherwise it would be a pain to roll them over the boots. This loops on the bottom of the vest are meant for the belt. Armor. No plate inside. Not sure if this is like the real thing or just lazy. It’s a tight fit. Won’t fall out of the sheath. I attached the sheath to the drop leg panel, but kept it the string in full length for future use. It’s hiding perfectly under the holster. Radio pouch and the VX-600 Radio. However this can open its lid. Probably had a faulty black bottle. SRVV admin pouch. I stored the standard flashhider inside. 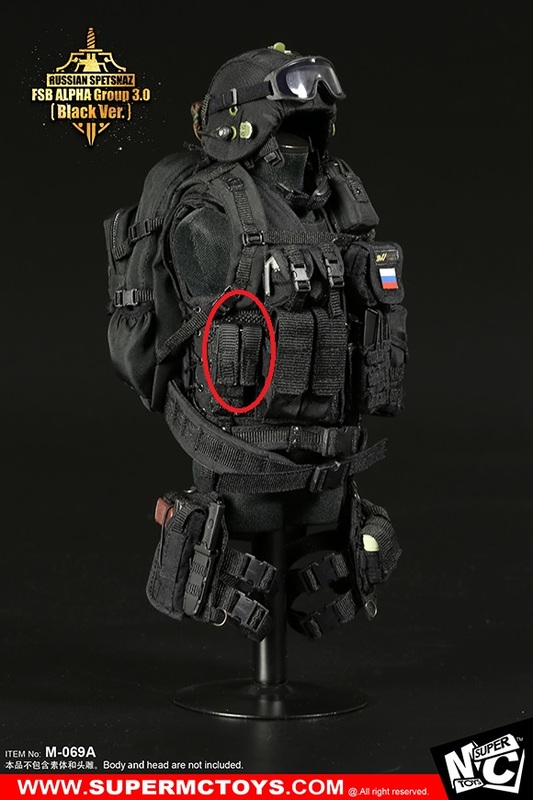 They advertised a Pistol mag pouch, however included 3 GL Grenade Pouches. The mags don’t fit. I emailed them about it. Replacement is the DAM 93004 DELTA FORCE - Sgt.FIRST CLASS -1993 SOMALIA Pistol Mag Pouch. I cut the elastic bands. Didn’t they promise sth else? It’s a sticker now. Rope. They really expect me to coil it up myself? This time I actually rappreciated MC’s laziness, because icychap from Youtube helped me learning how to do it. It’s not very difficult, no hidden ties as I thought. 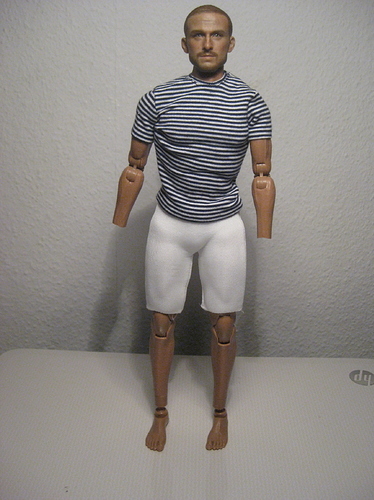 But took me some time to figure the perfect lentgh, so I didn’t need to cut off some rope or have the end hanging out. Altyn helmet without visor. I compare it to the former M-051 helmet which is the same, just without cloth cover. However on the supplied helmet, the micro is fixed into place and can’t be rotated. The frame and the glass are very soft and have the feel of an inflatable mattress. The goggles attached to the helmet. The goggle strap needs to be opened in order to do this. See the comparison to the DAM one and you realize the bad quality of this plastic item. I mean they put detail into their pieces, but the plastic is cheap and the execution of the molds is also very bad. The stock is meant to be pushed down completely. It’s possible, but the thin plastic from the cut out part from the stock is fragile, will bend and therefore also turn white, like cheap bent plastic. 2nd GL on the way. To open the barrel, I pressed it a bit downwards and then pushed forward, otherwise it might break the mechanism due to a small resistance. Thanks to @davinator65 I can show you this opening for loading up to 4 grenades into your GL. This 1:6 model somehow only takes two. One in the barrel and 1 to reload, where 3 were supposed to fit, when having a look at the 1:1. I marked the grenade in the barrel with a circle. AK-74M. The M actually stands for modernized. Field stripped it accidently by trying to slide on the rail mount, which revealed this to me. The green handguard came off too, but I didn’t dare anymore. The rail mount doesn’t even have a rail so it holds basically by friction, which means it’s super tight. Due to that I broke a part of the rail and had to glue it back on. Therefore I also didn’t remove it for the review anymore. Flip up sight too loose. Rail mount. Later I managed to push it on further. Here it sits too far back. The muzzle and silencer. Both sit appropriately tight. Zenit grip with light. It was impossible to slide on the rifle, so I had to take off some rubber and make it more loose. Mags. Primary one is the brown. Cheaply painted bullets. Color is all over the place. For the front loop, I would suggest removing the barrel first. The hook from the sling is quite rigid and hard to bend. Therefore I placed it with the opening touching the loop and held it there with one hand. Then applied pressure with my empty hand’s index finger on the hook and slid it on. This is actually the same rifle as the M-051. Only the barrel from the M-046. Well saved some money on tooling. Being finished on the individual parts I see certain analogies to DID. They are quite good in doing cloth accessories. However having a look at their plastic parts, they are quite bad/cheap in quality/material and execution, although it clearly has some decent detail. In the end every gripe can be forgiven, because it’s a great set. It even excels the DAM Alfa for me. Although it’s like 60-70% recycled stuff from older figures. 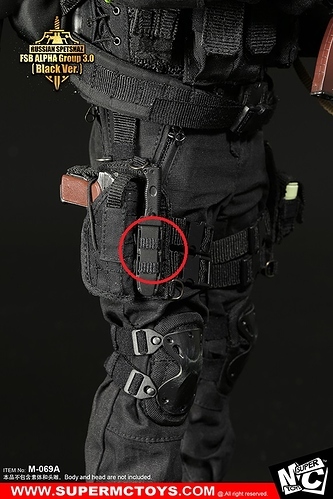 The only thing that can’t be fixed is the non-existing pistol mag pouch! In order to close the zipper I inserted a pin. This always makes me worry the zipper might not be able to withstand the tension and breaks. In the end I chose the original helmet. The Altyn with visor was too boring and I didn’t like it on this figure. I could have also swapped the visor to the other helmet, but I prefer the goggles as well. With the VANT shield. Review for the shield down below. Jeff, a retailer from a Malaysian figure store, probably had the last loose M-046 helmet with attachable radio cable on earth in his store and sent it to me. sixscale supplied the extra M-069A. Having done all that I have to admit I still prefer the original visorless helmet, so I kept the surplus helmets as loose parts. Good review @chpo. From reading the comments on the Chinese forums it seems everyone mentions the same things. From this set and the previous USMC set it seems like the same issues/concerns, good quality on cloth items, but still some room for improvement. Improving the quality of the plastics and fitment is something they should really concentrate on as they are trying to position the brand as a higher quality option. Seems like finding that middle ground between the low end offerings and the high end offerings like DAM/SS you either have to choose better plastic items over cloth items, or vice versa. Sorry you had so many problems with the set. It’s always disappointing when you have high expectations for something and it doesn’t deliver. Glad you managed to track down the green suit though! As for the GM-94…the stock does fold all the way down, but you have to be really, really careful. This is why I wanted two - one to keep the stock folded, one unfolded. The plastic really does feel like it’s going to break when you’re trying to clear the little tab that protrudes out and keeps the stock locked in place. What I did was use a small flathead screwdriver to keep the back of the stock behind the square hole pressed down as I worked it over the tab. I felt the back of the stock behind the square hole would buckle and tear otherwise. I am never going to try and fold it back up though - pretty sure it’s a one-way trip! Great review chpo. 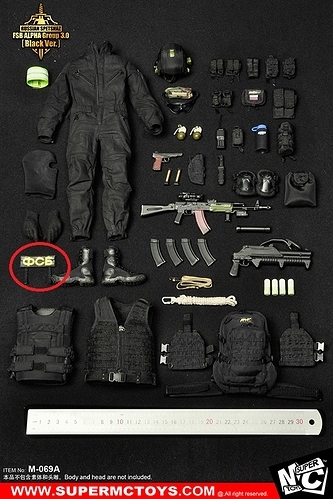 I know I’ve had issues in the past with MC Toys (ie Beslan Spetsnaz figure) and trying to get things to fit together properly. I had to sand off portions of the radio to get it to fit into the radio pouch for instance. Putting together the AK-74M from this figure was somewhat a chore. It finally got together how I wanted it to but I’m surprised I didn’t break it by the amount of force I used. I didn’t even bother messing around with the GM-94’s stock or opening the breach to put the grenade in. I have the Gorka version and am not even sure I want to put it together at this point. 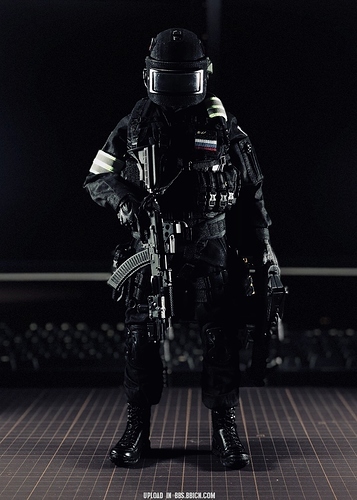 I have a Soldier Story body with the DAMTOYS KSK head mounted on it just sitting there but I just might leave this one in the box. Good to hear you all like it. Should be completed by next Friday. From reading the comments on the Chinese forums it seems everyone mentions the same things. I am glad to hear, that this hobby is still in a position, where customers can voice their opinions and it can matter/have an impact. Do you just copy and paste the Chinese into a translator to read? It was managable, but yes, a bit disappointing. You still have a gap to DAM, SS and even E&S. The weapon is probably Very Hot quality. Getting the suit was the biggest grind in 1/6 I had since getting the SS090 SFO SCO19. I had to sand off portions of the radio to get it to fit into the radio pouch for instance. Haha, I will see how that works with mine. Google translate comes in handy. I find it easier to install the browser extension as then you can force the page to translate when google decides to be fussy. Best way for consumers to have a voice is to do an honest review of the product and mention what design faults you find and provide suggestions for where things could be improved. It’s updated and complete now! Great review chpo. Thanks for the tips on how to adjust some of the issues with the set. Thanks for the tips on how to adjust some of the issues with the set. Glad I could help out. Enjoy your Gorka! Added a small update at the very end of this review. Thanks for the review, I am still optimistic/enthusiastic about the figure(s), “warts and all”. 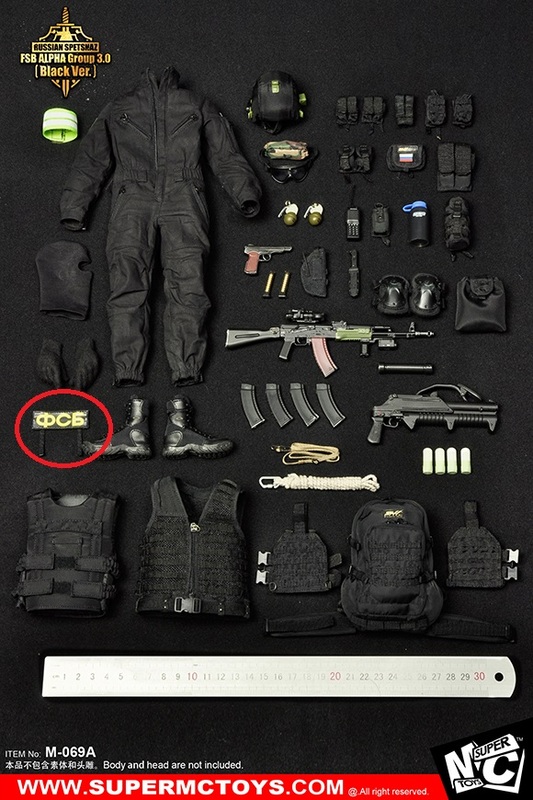 I missed the Spetsnaz FSB Alfa Group Accessory Set, back in 2015, think it was MIA in one of those shipping container cluster rodeos. That made ordering the latest MC stuff a leap of faith. Unfortunately the availability of the product is spotty. For whatever reason MC and all the other brands under that OEM aren’t consistently offered by distributors, even in China. Things have improved a bit since their rebranding. think it was MIA in one of those shipping container cluster rodeos. That made ordering the latest MC stuff a leap of faith. For whatever reason MC and all the other brands under that OEM aren’t consistently offered by distributors, even in China. Things have improved a bit since their rebranding. Just like retailers, distributors don’t carry everything that gets announced and it is left to the brand to sell direct. Very nice review and quite helpful when putting together my own set. Would it be possible for you to provide additional information on how you attached the knife to the drop panel? I’m at a complete loss on how to do that. Will very much appreciate it. Thank you again for your excellent review. 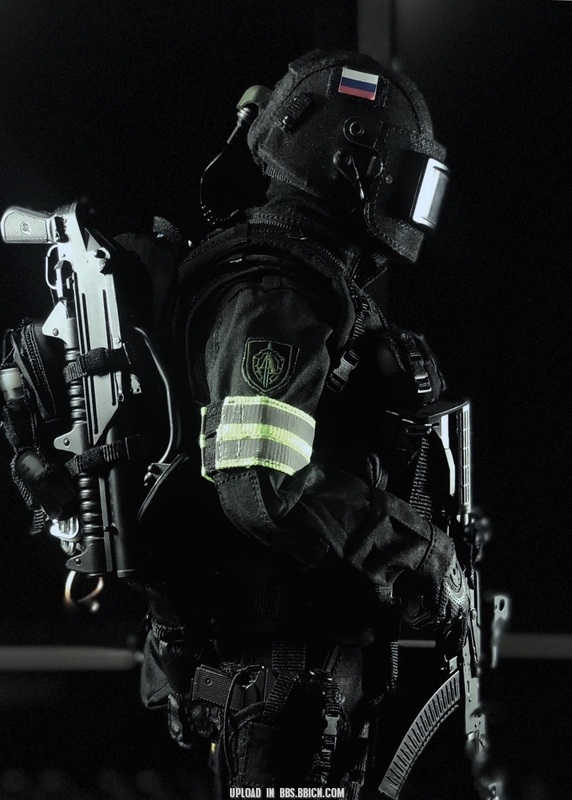 If you look in the small bag that has the sling and acog covers there is a small piece of black string. That is meant to be used to loop through the knife and molle webbing to attach it. Would it be possible for you to provide additional information on how you attached the knife to the drop panel? Through the sheath again and continue like this till you reach the top. You only need to pull it through two molle webbing strips at the figure’s drop leg panel. Also my example sheath here has three gaps, so one more than the original figure.